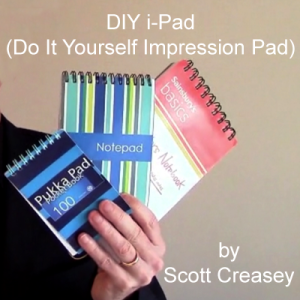 For the first time ever, in this 30 minute video, Scott explains and demonstrates how to manufacture the cheap and easy to use, real time impression pad he has been using for years. Once you have the materials together (they are cheap and widely available) and have watched this video, you will be able to produce one of these pads in about ten to fifteen minutes. If you can use a pair of scissors and tape, you can make "The DIY I-Pad"
No special pens, paper, pads, magnets or expensive refill pages. Produce small pocket pads, medium sized pads or the larger A5 reporter's pads ideal for close up and stage. 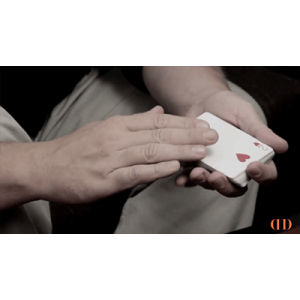 Finally Scott will teach you the basic handling for his under their noses, slow motion peek using the pad, along with his favourite handlings for a close up real time drawing duplication and a Test conditions Pre-show Drawing Duplication. If you are looking for a real-time, practical, innocent looking impression pad that you will use, then "The DIY I-Pad" is for you. You'll never buy another expensive impression device again.